Since the year 2012, the Sri Sathya Sai Institute of Higher Learning has been conducting a 2-3 day Summer Course in Indian Culture and Spirituality for the Students of the University. This Summer Course, though shorter in duration compared to the fifteen days long summer course organized by Bhagawan, is designed and structured along similar lines. Bhagawan used to organize the Summer Course in Indian Culture and Spirituality first in the 1970s which was open to all youth across the country (including at times some overseas participants too) and later in the 1990s which was exclusively for the students of the University. The main objective of the Course was to give students a strong spiritual foundation, which is achieved in part through lectures delivered by learned scholars, senior devotees and men and women of esteem. The highlight was the daily discourse by Swami, delivered typically in the evening. 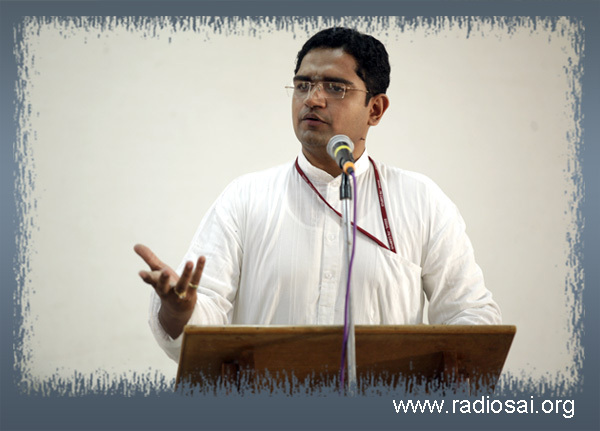 The Summer Course for the academic year 2012-13 was held from 8 to 9 June 2012 in Prasanthi Nilayam. As part of this Summer Course few of the young members of the faculty and research scholars gave inspiring and erudite talks on epics like the Ramayana and Mahabharata, scriptures like the Vedas and Upanishads, and a few esoteric concepts which form the corner stones of the great Bharatiya culture. We had earlier published a talk on, 'Law of Karma - A Tenet of Indian Philosophy.' We now bring you another talk delivered during that Summer Course. The Radio Sai Team is grateful to the SSSIHL for permitting us to share with our readers these transcripts. This talk was delivered in the Poorna Chandra Auditorium on 8 Jun 2012. As I stand here, I see both veterans and youth of the Sai army seated. Ramayana is the greatest epic ever witnessed in human history. No other story has been reproduced in as many versions, languages and varied cultures, across religious borders. I have a fact file, which says that depending on the method of calculation, as many as 300 versions of the Indian epic poem Ramayana are known to exist. The oldest version is, of course, the original version written by sage Valmiki in Sanskrit. Ramayana has spread to many Asian countries like Burma, Indonesia, Cambodia, Laos, Thailand, Philippines and China, to name a few. It has been translated into as many as eighteen Indian languages, including Sanskrit. I found a very interesting statistic on a website called Triangulations. They conducted a study on the popularity of the Indian scriptures based upon thousands of websites and reached a conclusion that The Ramayana is by far the most popular of Indian scriptures all over the world. Ramayana literally means the journey of Rama. How can a story that happened twenty thousand years ago continue to inspire the current generation? 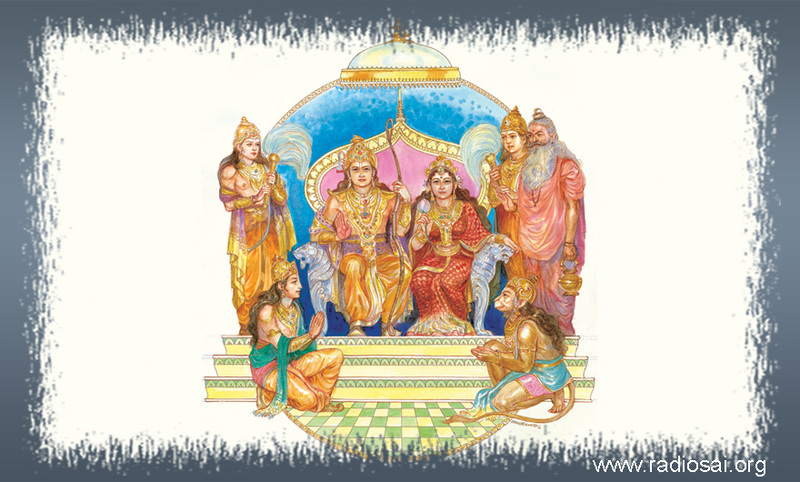 Another question arises – Is Ramayana still relevant today? This is how she took the blame of sending the Lord into exile for fourteen years. Mother Kaikeyi is more relevant to us today than ever before. In a society that is torn by factionalism, which knows only the language of revenge, Angada is a distinctive, great example. He knew perfectly well that his father was slain by Lord Rama himself, yet he fought in Lord Rama’s army like none other, for he knew that dharma was on Rama’s side. 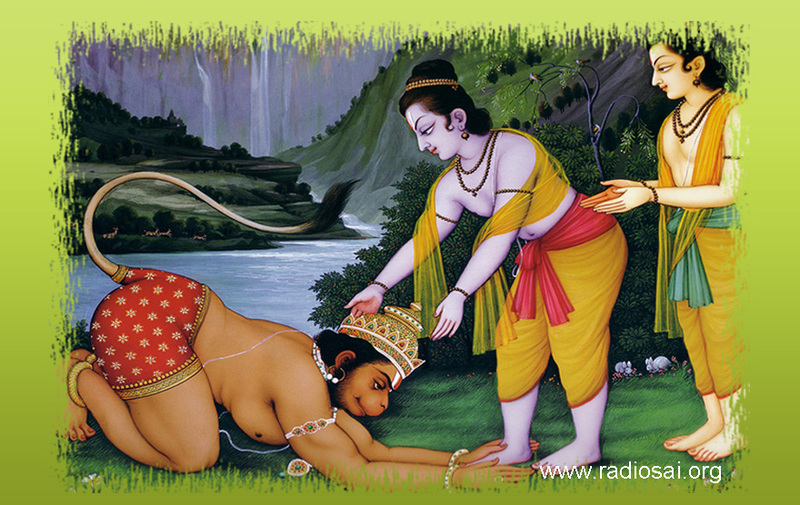 He completely surrendered to Lord Rama and was a mighty challenge to any asura that came across him. In a world where friendship is measured by the size of the pocket or by the number of friends that we have on social networking sites, Jatayu stands out as a grand example. He gave up his life trying to protect mother Sita from Ravana in order to honour his friendship to King Dasaratha. Jatayu is more relevant to us today than ever before. Lord Brahma had told sage Valmiki: yavat sthasyati girayaha saritasya mahi tale, tavat ramayani katha lokashu pracharishyati. As long as the mountains and rivers exist, the story of Ramayana will continue to inspire every single individual on the face of the earth. Bhagawan explains this śloka and says that by mountains, Lord Brahma meant men and by rivers he meant women. As long as men and women exist on this earth, Ramayana will serve as a beacon light of hope for each and every one of us. ONE: Kousalya Supraja Rama: King Dasaratha and mother Kousalya were King Manu and Queen Shatarupa. 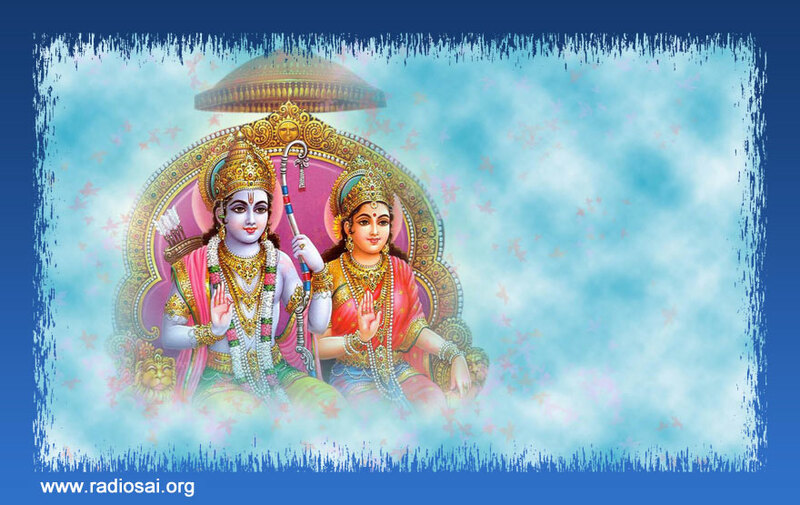 As Manu and Shatarupa had done intense penance and the Lord himself had manifested in front of them and granted them a boon, together they both asked the Lord that they want somebody just like Him to be born as their child. The Lord smiled and said that in this entire cosmos there is none like Him. So the Lord decided that He Himself would come as their child. Thus Manu and Shatarupa were born as Dasaratha and Kousalya and Lord Sri Rama was born to them. But mother Kousalya as Shatarupa had asked for an additional boon. She said, “Lord! In all your bala leelas, I might forget who you are, so please grant me an additional boon that I should have absolute faith and conviction about who you are.” This too was granted to Mother Kousalya. Mother Kousalya represents the very epitome of equanimity in the face of pain and pleasure, joy and sorrow. Though she played her role in the divine drama, be it the pattabhishekam, the coronation ceremony, or exile into the forest, she was absolutely aware and inside she was like the deep placid sea. The qualities of absolute equanimity, unconditional love and acceptance for whatever Rama said brought Kousalya near and made her dear to the Lord. TWO: Vaidehi Priya Rama: The next personality who was near and dear to the Lord as Bhagawan said is Mother Vaidehi or Sita. She was not only dear to Lord Rama because she was his ardhangini or better half, but there was a deeper, inner significance to this. Bhagawan once was speaking to MBA students in Ganesh Portico (Sai Kulwant Hall). It was the beginning of the year and the students were pleading Bhagawan to grant them a class interview. Bhagawan as usual smiled and said, “You all get your wives, then I will grant you an interview.” Students knew that He always jokes with them, so they continued with their pleading. Bhagawan was walking away and as He heard them continuing with their pleading, He stopped, turned towards them and asked, “Are you understanding what I am saying?” He added, “Your mind is your wife, atman is the husband.” When there is perfect understanding between the mind and the atman, there will be peace and harmony at home, which is the human body. Bhagawan also said that if the mind goes in one direction and the atman goes in another direction, the result is diverse (pun). He beautifully gave the significance of Sita Rama kalyanam. He said that Sita represents the mind and Lord Rama represents the atman. The marriage is the submission of the mind to the wisdom of conscience. But how did this happen? There is an intermediary for this confluence of mind and atman to occur. Bhagawan beautifully describes how the marriage of Sita and Rama had actually taken place, which is not found in any of the scriptures. Bhagawan says that mother Sita was short in height compared to Lord Rama and was waiting to garland him for the marriage to be complete. 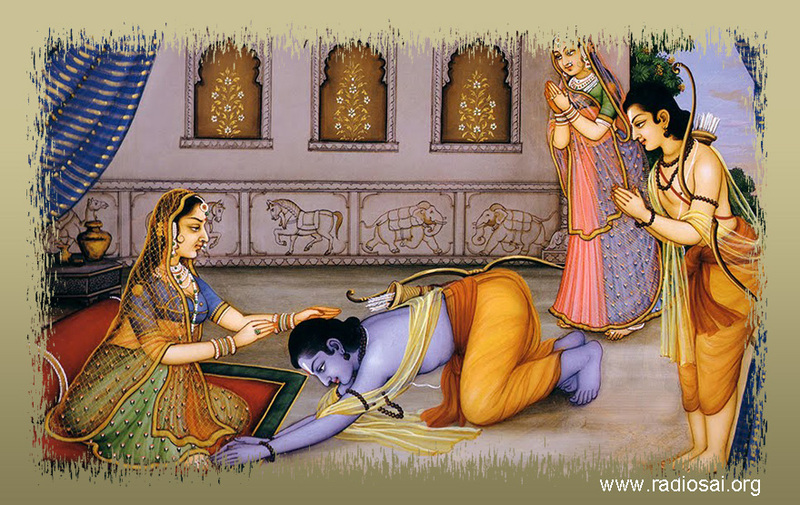 But Lord Rama had taken a vow that He will never bow his head in front of anyone except his mother and his guru. He was looking straight into oblivion and mother Sita was trying her best to garland Lord Rama; but in vain. In that very moment Rama glances at Lakśmana; and Lakśmana immediately recognizes it, as he represents sookshma buddhi (subtle astute intellect). He falls at Rama’s feet and as Rama bends down to pick him up, Mother Sita garlands him. Hence the marriage was complete. For the marriage of the mind and atman (conscience) to take effect, what is important for us is to turn our buddhi or intellect inwards. Buddhi is a channel between our mind and our conscience. That is why we see that wherever there is an idol of Sita and Rama, Lakśmana has to be present there. So for the confluence of mind and conscience, buddhi too is essential. 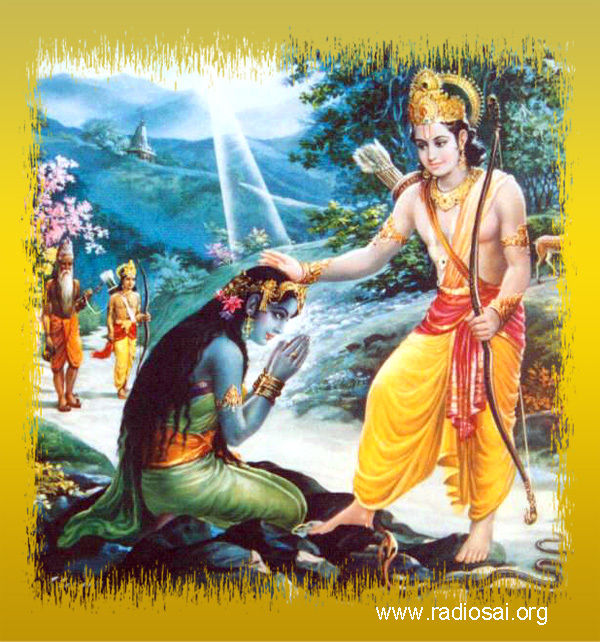 Hence Sita was dearest to Lord Rama as she completely surrendered to the wisdom of the Lord. The lessons learnt from mother Sita is to follow the conscience and practice discrimination to be near and dear to our Lord Sai Rama. THREE: Ahalyoddharaka Rama: We all were surprised as there are many mighty personalities in Ramayana like Vibhishana, Angada and Sugriva. However, what we miss to notice in this grand epic is that there are a few wonderful devotees of the Lord whose mention in the story is negligible but their devotion to the Lord is of epic proportions. Mother Sabari is one such devotee. She was told by her guru Matanga Muni that one day, the Lord Himself will come to her hermitage. With complete faith in her guru’s words she would clean the entire hermitage, make a seat ready for the Lord to sit on, pick wonderful flowers, and get the tastiest of fruits ready for Him. She did this everyday for years as she did not know on what day or time her Lord would arrive. She is the very embodiment of purity, patience and perseverance; qualities that are dearest to Bhagawan. Mother Ahalya too knowingly or unknowingly committed mistakes, but the moment she came to know that her redemption lies at the touch of the lotus feet of the Lord, she forgot all her agony. She was transported into transcendental bliss. In that moment, she vowed to be dedicated in unending love and devotion to the Lord and undertook an eternal wait. Patience and perseverance are grand ideas that can take us near and dear to the Lord. What is important is not only to have purity, patience and perseverance, but also to be ready to be transformed in the Lord’s hands. This is the reason all of us have been given the opportunity to be in this divine portal. We have committed ourselves here to be transformed in the divine hands and become the agents of transformation for the rest of the world. Hanuman, because of his pure love for the Lord was divinely inspired with an idea. He requests Rama to grant him a very small and trivial job. Everyone was eager to know about the job that they had missed out, but one that Hanuman is able to recognize, however trivial it might be. Hanuman immediately said, “When the Lord yawns, let me be there to snap my fingers for Him.” Lakśmana, Bharata and the others did not recognize the consequences of this and readily agreed to it, thinking that it is a very small, trivial job as the Lord will yawn only a few times in a day. They soon learnt that Hanuman was all over the place. Wherever Lord Rama went, Hanuman followed him. Others stopped Hanuman and asked, “What is it that you are doing? You said that you will only snap your fingers when the Lord yawns, and now you are walking behind Him, following Him wherever He goes.” Hanuman smiled and submitted very humbly, “How do I know when my Lord will yawn; so I have to be with him all the time.” That is his love for the Lord. Once to test Hanuman, Rama started praising Lakśmana in Hanuman’s presence. Rama said, “There is none who served me like Lakśmana. If I have to single out one person who has done extraordinary service to me all through these years, it is Lakśmana and none other.” One would expect that Hanuman will think, “What is it that Lord is saying, it is I who got the Sanjeevani parvat and revived Lakśmana, it is I who crossed the ocean and found where mother Sita is.” But these thoughts never occurred to Hanuman. In that very moment, the thought that came to him was, “My Lord is indicating to me that Lakśmana has served me diligently, you have served me enough, now spend some time in serving Lakśmana too.” From that moment onwards Hanuman started dedicating some of his time in serving Lakśmana. That was his attitude of selfless service to the Lord without a trace of ego. He is the true example of how Bhagawan expects us to be, i.e. to go from dasoham to soham. This is what is implied by the name Hanuman. It can be divided into three parts – H-ANU-MAN. H represents “His”; ANU in Sanskrit represents “atomic”; meaning the Lord’s atomic form is MAN. Hanuman was constantly aware of this truth, so he verily represents the journey from dasoham to soham. FIVE: Bharatagraja Sri Rama: The next personality who was dearest to Rama was His younger brother Bharata. One day in their childhood, all the four brothers were playing a particular game. In the middle of the game, Bharata came running to mother Kousalya and started weeping. Kousalya enquired whether he had lost the game (as he was weeping). Bharata replied, “No mother, every time Rama wins, but this time He deliberately lost so that I could win, and I can’t accept this.” What an ideal feeling of brotherhood! Bharata dedicated himself to the life of a hermit, because he could not imagine his brother living such a life in the forest of Dandakaranya. What did he do in those fourteen years of separation? Every single moment he contemplated on Lord Sri Rama. Bharata’s contemplation was so intense that when Lord Sri Rama returned after fourteen years to Ayodhya, no one – including the three mothers – could tell the difference between Bharata and Rama. They looked absolutely the same. 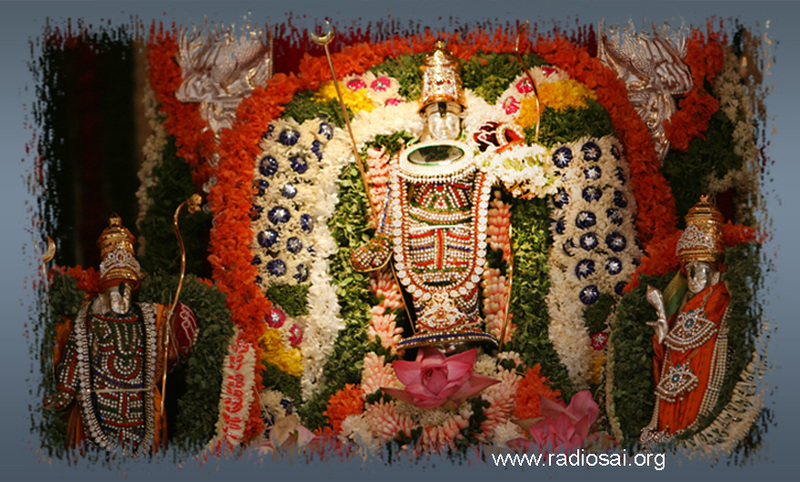 Saroopyam, Bhagawan says, is the result of constant contemplation of the Lord during His physical separation. Saroopyam also means absolute surrender to the Lord’s words. 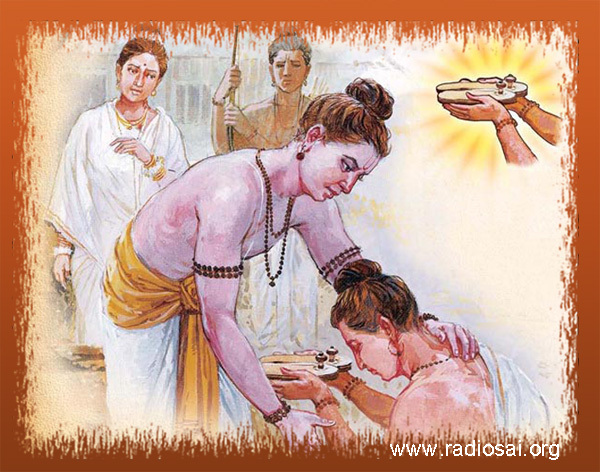 Whenever any task came Bharata’s way, he would think what Rama would do regarding this task. He used to contemplate that if he performed that task in a particular manner, would it please Lord Rama? This inspired him in all his actions and in the end, Bharata’s life became Rama’s message. Bhagawan says that adherence to the Lord’s lotus feet and to become one with Him is to follow His words diligently. Do constant contemplation (Nitya Chintana) and follow the master to have darshan of the feet of the guru (tat padam darshitam yena). 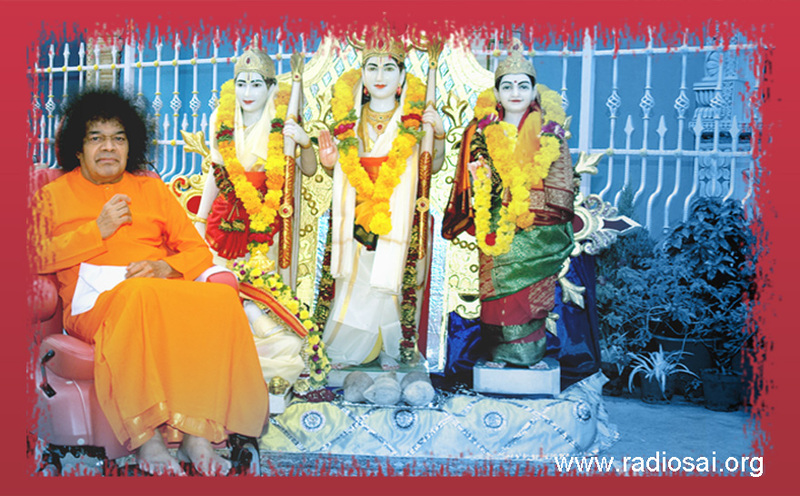 Swami says Guru means gunateeta and roopavarjita, meaning one who is beyond attributes and one who does not have a form. How would the lotus feet of one who has no form look like? Bhagawan explains that the lotus feet of the guru signify His message, His life. Many a time He has told us that His life is His message and that to worship and have darshan of His lotus feet implies that we follow His footsteps and make our life His message. I pray to Bhagawan that each of us should gain inspiration from these personalities from the wonderful epic Ramayana and imbibe those values in our day-to-day lives and become nearest and dearest to Him.